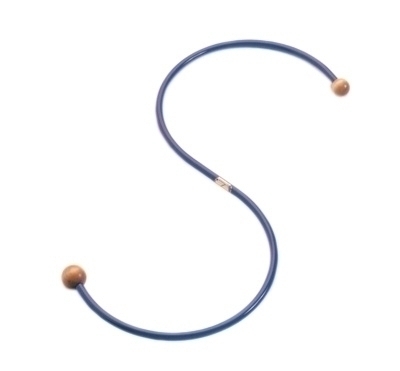 Hand crafted from a steel bar, bent in the shape of an "S" with wooden balls, one relatively small and one somewhat larger, permanently affixed to each end. To use, hook the device over the shoulder or under the arm and use its leverage to apply direct, deep, steady pressure to trigger points in the muscle groups. Regular: 19" length, curves 9" across. Dimensions: 12" x 1.25" x 9.5"